The book Anna Karenina was made into the movie Anna Karenina. 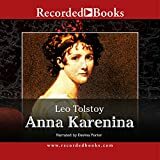 Anna Karenina was written by Leo Tolstoy. The book was published in 2004 by Recorded Books. More information on the book is available on Amazon.com. Happy families are all alike; every unhappy family is unhappy in its own way. Thus begins Leo Tolstoy's masterpiece. Tolstoy's own spiritual crisis and his search for the meaning of life are deeply felt throughout this powerful tale about the growth and death of love. The touching picture of Anna Aarkadyevna Karenina's slow disintegration has fascinated readers for well over a century. Beautiful and charming, Anna lives in a splendid world of her own making. She smokes, rides horseback, plays tennis, takes opium, practices birth control, and-although she is already married-falls in love with a handsome army officer. Anna's life is played out against a backdrop of dazzling balls and the vastness of the Russian landscape. A magnificent story that shimmers with intelligence and passion, Anna Karenina is one of the most extraordinary novels ever written. The movie was released in 1997 and directed by Julien Duvivier. Anna Karenina was produced by Madacy Records. More information on the movie is available on Amazon.com and also IMDb. Actors on this movie include Vivien Leigh, Ralph Richardson, Kieron Moore, Hugh Dempster, Mary Kerridge, Marie Lohr, Frank Tickle, Sally Ann Howes, Niall MacGinnis, Michael Gough, Martita Hunt, Heather Thatcher, Helen Haye, Mary Martlew, Ruby Miller, Austin Trevor, Ann South, John Longden, Gus Verney and Leslie Bradley.